The light at North Lake was dramatic and the water mirror-like on the first Saturday morning of October 2010. The dawn began with dark clouds, punctuated by dramatic light peering through, which gave way to lovely cumulus clouds and deep blue skies. Several of the many photographers packed-it-in too soon since the dramatic light was all too brief (in fact, I missed it since I returned to the car to change lenses). There was a photo workshop group there so it was quite crowded in the spot where most photographers set up near the first day use parking area. The Aspen trees in the parking area had already been partially stripped; on my trip the prior year they were quite stunning while my lake shots were a bust. Plenty of nice reflections which I photographed to what I felt was good effect. Although I missed the earlier dramatic light, I'm quite pleased with this shot. 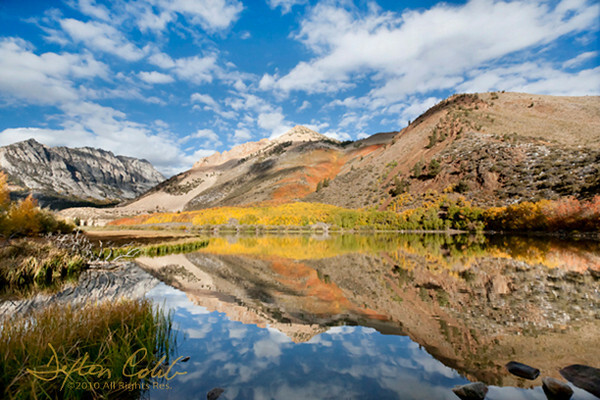 No need to return to the Eastern Sierra in autumn for a few years. I can now venture further afield to Utah and the Colorado Plateau for the wonderful fall colors there. A Singh-Ray 3 stop soft-edged graduated neutral density filter was used in this shot.